So we had ourselves a little holiday blizzard here, and I'm not talking about a WBFDC (Whoppers Blizzard From Dairy Queen) where the Whoppers are nice and crunchy and the ice cream is cool and tasty. Mmmm, love those. So perky. But no. I'm talking about a real honest-to-goodness blizzard, where the snow blows sideways and you end up with almost three feet of the white stuff in your driveway. 2. John's little commuter car was no match for the snow and he was stranded for hours trying to get home from work on Wednesday. A friend with a 4-wheel-drive truck was finally able to make it to him, but the process of pulling his car out of the snow ripped it up, so ol' Blue is going to have to visit the car doctor this week. 3. The last of the shopping that you had hoped to accomplish prior to Saturday, the biggest procrastinator shopping day of the year, was not completed. Which brings us, naturally, to Saturday. The biggest procrastinator shopping day of the year. John and I started out early. So early, in fact, that we arrived at the bank at 8:45 am, eerily reminiscent of a previous post in which I jumped on the automatic door openers for several seconds before cluing in that the bank didn't open until 9:00 am. Care to guess whether I did the same exact thing again? Oh come on! Do you really believe that I would make the SAME.BONEHEAD.ERROR twice in one year?! I jumped on that sensor pad with gusto. The bank employees stopped, stared, spat their coffee and choked on their Danish butter cookies. John was spared the embarrassment by taking an inordinately long time getting out of the van and navigating the ice skating rink that was the parking lot. So long, in fact, that I had already come sliding out to him, hissing "Not open! Not open yet! Run! Run!" So we went to the post office instead to, yes, mail our Christmas cards. Who doesn't enjoy getting Christmas cards on New Years, I always say. Actually, I never say that. John was putting stamps on the domestic cards while I waited in line to mail a card to our friends in the Czech Republic. A mail carrier walked in and started trash talking with the guy behind the counter. MAIL CARRIER: You call this a snow? Geez! You guys got a DUSTING compared to what we got up north. If I knew conditions were this good I'd have been here yesterday! COUNTER GUY: (for some reason feeling the need to defend their snowfall) Well the sun's been out and a lot has melted off. LADY IN LINE: (for some reason feeling the need to be included in the conversation and to defend their snowfall) We had THREE FEET of snow in our driveway! MAIL CARRIER: Three feet?! That's nothing - I couldn't get out my front door. COUNTER GUY: Front door? I had to climb out a window! 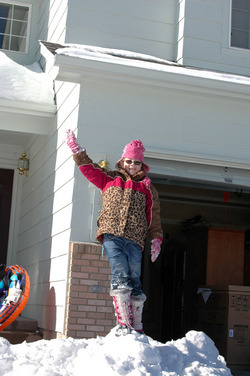 LADY IN LINE: I had to ski off the roof! OK, so maybe I exaggerated those last few comments, but they were seriously bickering about who got more dumped on, when, at last check, none of them were on Mother Nature's advisory committee. John and I slid back the bank and then it was time to hit the stores! Our main objective was Emma. Right around Thanksgiving when the big toy ads came out I realized that we had a problem. I gave each kid a different colored pen and asked them to circle anything that caught their eye. It would have been much more ink-conserving to tell Karl to circle what he DIDN'T want, since there were only about three items not circled in his color. From preschool toys to Dora cash registers, my son made it inkingly clear that he wanted it all! Over the last month I've periodically asked her what she wants for Christmas. ME: Emma, isn't there anything specific that you've been wanting for Christmas? EMMA: Not really. But I know I'll like everything I get! We had a couple of ideas, but basically we were relying on wandering the aisles of Toys R Us until something caught our eye. Us and every other blizzard-frazzled resident of Colorado, that is. It was crazy, to say the least, but we persevered, seeking temporary refuge in the clothing section. Apparently nobody is getting clothes for Christmas. They were out of the dance moves thingie that hooks up to your TV and teaches you to move like Napoleon Dynamite, so it was time to face an uncomfortable scenario . . .
JOHN: We're going to have to try Best Buy. ME: Noooo! We have no provisions! We only have half a tank of gas. It can't be done, man! It took us twenty minutes to get into the parking lot. It took us another fifteen to get parked. It took us about ten to discover that the dancing game was sold out. We followed her to the computer, our eyes darting to every shelf and the unmistakable scent of desperation wafting through the air. Mental soundtrack: Would she like a crockpot? Weird Al CD? Compressed air to clean out a keyboard? Oh wait - I need that. Do I need the monitor wipes too? Is the value pack better? No, I'll just stick with the junior can. Would she like a Hello Kitty mousepad? Disco ball? 1001 great fonts? Binocul . . .
SALESLADY: It says we have three more of those dance games here in the store. SALESLADY: Well I'm not sure. I haven't seen them in weeks (we know!) but let me look around. I have an idea. I couldn't stand the suspense. I went in search of a wireless router for my parents while John waited for the search results. As I stood in front of a wall of routers, a salesguy wandered by. ME: Excuse me . . . which of these brands of wireless-g routers do you think is best? SG: Well, if you really want the best quality you should go with a wireless-n.
ME: Oh we're up to "n" now? So out of curiosity, why isn't it "wireless-L"? I mean, we skipped from b to g, which was 4 letters, so why not skip 4 again? Why 6? If we skip 8 letters next time and then 10 . . . well you can see how quickly we'll reach "wireless-z" and then where will we be? Somebody should probably do something. SG: (staring at me blankly) So . . . yeah . . .wireless-n. But it's very expensive. As I strolled back through Best Buy, clutching my obsolete router, I spotted John. As if in slow motion, parting the sea of people, he was approaching me. He tossed his curly locks. His eyes gazed at me in triumph. For there, swinging jauntily from his left hand, was . . . the dance game!!!! ME: Oh my gosh! You got it!!!! YOU GOT IT!!! Squeeeee! (And then, noticing all the people looking at us, probable coveting the dance game that hadn't been seen in weeks) Augh! Don't let them see it! Run! Run! We had another excellent success story at Best Buy, snagging another supposedly sold out item, so that, by the time we made it back to the van, and then out of the parking lot, we were on a shopping high the likes of which hadn't been seen in ages. ME: We SO conquered Best Buy! JOHN: I can't believe we snagged TWO items that were GONE! All those people are still back there, wandering around like zombies, whining "I don't shop good!" while we speed away with the treasure! Suh-weeet! The presents are wrapped and under the tree. Emma has already sorted, counted and developed a game plan. Mom's cooking a pie (and by "cooking a pie" I mean "flaunting her kitchen") and I have a date with two eager children, fresh in from playing with Poppa in the snow, to make a gingerbread house. The router is working quite nicely and I think any Christmas Eve that finds me still in my pajamas, smelling Mom's cooking, clicking away on my laptop while snow-intensified sunlight streams through the windows, with nothing much else to do . . . to be quite a blessing. Kitchaga update: drywall patching and cabinet delivery happening today. Oh joy! Temporary Kitchen update: the initial surge of "we're a perfect family, tra-la-la!" joy has completely worn off, we're all sick of eating off paper plates on a rickety card table, and washing dishes in a tiny bathroom sink - especially a crockpot - is a pain in the asshat! We were watching Monday night comedies the other night. And by "we" I mean Couch-John and Couch-Karen, of course. Only now we're Chair-John and Bed-Karen in our arranged temporary TV room. We have both realized that the chic and stylish chair that we bought for the living room is actually pretty darn uncomfortable, but John has to sit there because half of the bed is covered with beads and wire. 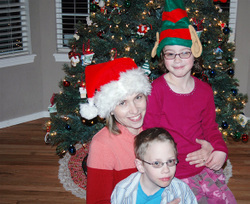 So Monday night we finally put up the Christmas tree and although these photos would lead you to believe that it was a holly jolly time, I was only smiling because (a) the ordeal was over, (b) it was bedtime for the kids, and (c) John was making us Lemon Drop martinis to (a) toast our successful survival of tree-trimming and (b) celebrate four new episodes of Monday-night comedies. 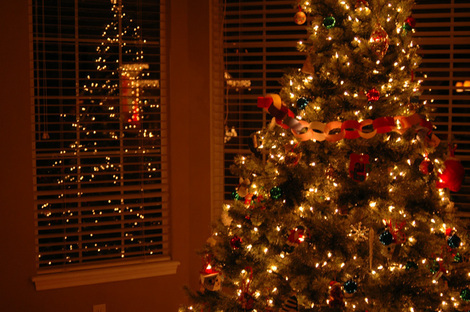 The only reason that tree-trimming was so stressful is because Karl appeared to have bottled up a day's worth of energy and released it all at once, resulting in him dashing to and fro like a madman, sliding around on the floors in his socks with little regard to who or what he might collide into, hastily throwing ornaments on the tree (several of which promptly fell onto the new floors and one shattered), earning the nickname "Grabby Grabberson" for the way he snatched ornaments out of everyone's hands, and flipping the lightswitch to turn the tree lights on . . . and off . . . and on . . . and off . . .
See that look on his face? That's the "Rats! She caught me!" look. Now the importance of the Lemon Drop martinis is that (a) they're delicious, (b) they're potent, and (c) they make already-funny Monday night comedies even FUNNIER, but also a little FUZZIER! In one of the comedies, and I don't remember which one (see? Fuzzy!) somebody was called an "Assface". Only I heard "Asshat" because that Lemon Drop was so tasty and mind-altering, you see. John: (laughing uncontrollably) It wasn't *choke* "Asshat", *gurgle*, it was "Assface" *chuckle* "Asshat!" What kind of word is that? Me: (with dignity) It's a term. John: I'm SO using that tomorrow! Me: Exactly. Use it enough and I'm sure it will catch on. John: What are you asshats doing in there? You're giggling like a couple of school girls! Unfortunately his most excellent use of "asshat" went unnoticed or, at least, uncommented-on, but he's determined to make it part of their daily vernacular. And the funniest thing about it is that Asshat really *is* a term! I mean, I didn't make it up or anything, but apparently John had never heard it, because he's throwing it around like it's the new "Bitchen"! I was immediately struck by the ingenuity of it. I LOVE, LOVE, ADORE AND LOVE to do something unexpected with my craft supplies. 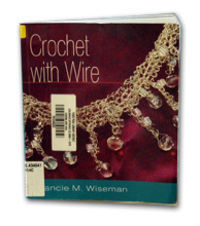 Apparently Ms. Wiseman has also written a book about knitting with wire, so she ain't no "one-hit-wonder" in the needlecraft world, let me tell ya! Anyway, I checked it out lickety split cuz I had beads, and I had wire, and I had a crochet hook buried somewhere in the storage room. Even Santa is rolling his eyes at me! The Bunny would probably roll his eye, too, if he wasn't so enthralled by his fluffy tail and wondering how he can survive as a quadruple amputee. I was determined to make Ms. Wiseman proud, so I toddled off to the craft stores with my coupons and supply list. I've been crocheting ever since. Wire is tough on the fingers. 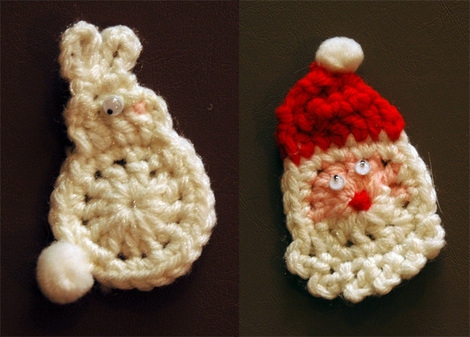 I couldn't always follow the terminology on the stitches, what with me being a very novice and rusty crocheter, but the nice thing is that you can pretty much just do your own thing and turn out some lovely pieces. Some lovelier than others, mind you, but all of them at least decent. I'm not sure about the "suspended bead eggs" piece, but John assures me that "it's a look". And actually, when I tried it on it was sort of nifty looking. I'm going to put each one in a pretty box and, along with hand lotion, give them as teacher/therapist/bus driver gifts. What do you think? Well, not the morning bus driver, because he's a dude, but everyone else. And so things have just been rather jam-packed around here and when we got home from Ev's house last night I had to get back to work on my classes so I requested that John start wrapping some of the gifts that need to be mailed. Surprisingly, he agreed, although he doesn't like to do the ribbons. See how the babies love the toy? But let's remember that we're talking about a very small baby here, who may not initially be able to turn on the music himself. Well Fisher Price thinks of everything! They include a remote control for the driver! When I showed the toy to John last week his comment was "Shouldn't the driver be, you know, keeping her eyes on the road?!!" "Well a crying baby can be very distracting while you're driving. 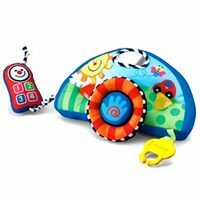 This way you can soothe the baby by starting the toy!" I replied. So let's get back to John's present-wrapping duties. He initially asked if the toy I bought for Drew, who is three, was for Owen. "Owen is a BABY, John! Obviously he can't BOWL!" "Oh. Right. So what did we get for Owen?" "The toy for the carseat that has the remote control - remember?" Well listen and behold, naysayers. He sounds croonalicious! And don't be surprised if all day you're humming this tune. Oh you'll hum, all right! What's the tune for "I told you so"? So much has happened in just a couple of days. We moved the big TV and Moxi (our DVR) up to the guest room. I also put the end tables, lamps and the living room chair up there. I basically just slapped the stuff in the room, apparently in an unsatisfactory manner. 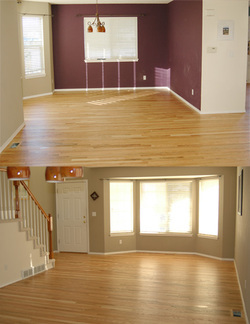 John: How should we arrange this room? Me: Arrange it? What do you mean? I thought we'd just sit on the bed and watch TV. John: (looking at me like I have two heads) THIS is going to be our TV room for a MONTH! It should flow nicely! Me: (looking at HIM like he had two heads) Uh, OK. How about we push the bed over there, put the chair and ottoman over here, and cast a cheery glow with a strategically placed lamp? John: (ignoring the sarcasm) PERFECT! Help me move stuff. John: I caught up on your blog. John: Yeah. I read that part about "Kitchen-John and Couch-John". Am *I* supposed to be "Couch-John"? Pretty HARSH, don't you think? Me: (waving off his comment) No, no. It's just a way to distinguish you two. I mean, the couch is a universal perch for a husband. Everyone would immediately know that I was talking about you. I couldn't exactly call you "Bike-John" or "Engineer-John" or "Save-the-environment-John", because it would require additional explanation. It's about succinctness. Plus . . .
Me: . . . you DO spend a lot of time on the couch. Me: Well I wasn't talking about two Karens. John: But if you ever DO talk about two Karens, you will refer to yourself as "Couch-Karen", right? Me: Sure. Or Blog-Karen, or . . . I've been invited back to Holland! I'll be teaching at Akke Fietje in Eindhoven, Netherlands, January 19-21st. I will design two brand-new classes for the event - one mini-album project and one double-page layout project. Look for updates here and on my Teaching Website in the coming weeks. For John: Akke Fietje has two owners, one of whom is named Karen, who we will refer to as "Carin" for two reasons: 1.) because that's actually how she spells her name, and 2.) so as not to confuse her with COUCH-KAREN!!!! That is SOOOO COOOL! I feel so honored, and special, and in need of better makeup, and special, and privileged! THANK YOU, DEL!!!! The magazine has been on display in the brown basket, while I subtly find reasons to mention it to people. Me: Yes, we ordered extra pepperoni. Whoops! I'd better be careful with this hot pizza around the magazine with my picture on the cover! Keep the change, by the way. Me: So I should stay off the floor for a few hours, then? OK, I'm just going to run a few errands. Hang on, I almost forgot to grab the magazine with my picture on the cover! Me: Yes, the fridge can go right there next to the garage steps. Let me just move the magazine with my picture on the cover so it won't be in the way. And now I must depart. The shops are open, the kids are at school, the contractors are done for the week, and I have COUPONS! It's only been a week. 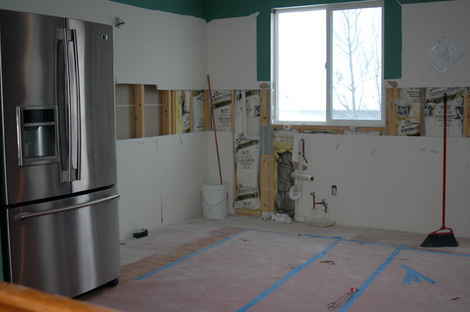 One week ago they tore out my kitchen. Ev invited us for dinner that night. She invited us for dinner the next night too. That was Friday, when we ordered Chinese food, sent the children off to play in the basement, and settled in the dining room with our fried rice and cranberry coolers. What do four thirtysomething parents talk about on a Friday night? Why music from the 80's of course! Desi: Hey! Has Ev told you about my extensive playlist of the best songs of our generation? (moves over to the computer) Go ahead - name any song that you loved from the 80's. Desi: (shooting me a look that conveyed that he expected more of a challenge) Got it! Desi had them all! Duran Duran, Mike & the Mechanics, Prince, Police, Beastie Boys, Rick Astley, Rick Springfield, Madness, Talking Heads, The Fixx, C&C Music Factory, The GoGo's, The B52's, The Cars, Styx, ACDC, Bon Jovi, Def Leppard . . . we couldn't stump him! He had EDDIE MURPHY, for goodness's sake! John: (adopting his best TV infomercial voice) Do you remember THIS hit from the 80's? They're all here, all your favorites! What would you pay for a collection like this? $99.95? $129.99? But wait, there's more! Order now and we'll throw in a commemorative Devo hat and a free set of steak knives! The whole evening was hilarious. Thanks, Desi! The next night we were cruelly cut off from the gravy train that was "Ev's house for dinner" and were expected to fend for ourselves. We ate out. On Sunday Ev and I met some of the girls from our crop group for an impromptu day of scrapping at a local store. I worked on more altered baskets, which aren't quite done yet but since I'm trapped in the basement while they're staining the floors today, I should be able to get them finished. We left the store right about dinner time, so we stopped to pick up food for our families. Ev was driving, and was attempting to merge into a fast-moving three-lane road. She had an opening, but didn't take it. Ev: I probably could have made it, but I'm just being cautious since I don't want to hit any black guys. Me: Huh? Why would you hit black guys? OH, you mean because it's DARK OUTSIDE?! I can't BELIEVE you! Ev: Black ICE! I don't want to hit any black ICE, you idiot! I set up a temporary kitchen in the basement. I arranged two tables into an L, added a card table in the center for eating, arranged the microwave, sandwich maker, toaster, crockpot and George Foreman grill where they could be easily accessed and used, created a pantry shelf, and made a dishwashing station in the bathroom. That night I made hamburgers. 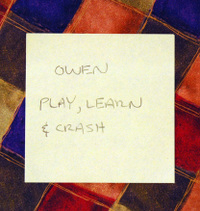 Yesterday, fueled by my success, I went through the crockpot recipe book that Ev loaned me and made a grocery list. The fridge is in the garage, which made it a breeze to unload all the perishables. Joe, the floor installer, thought I was slightly insane when I drove up with a van full of groceries to a house with no kitchen, but we ate grilled fish and rice last night, so there! Me: John, do you realize that this temporary kitchen has made us (a) plan meals ahead of time, (b) eat as a family every night, and (c) clean up after every meal? We're on the same level of the house all the time, we always know what the kids are up to, we're not scattering after dinner . 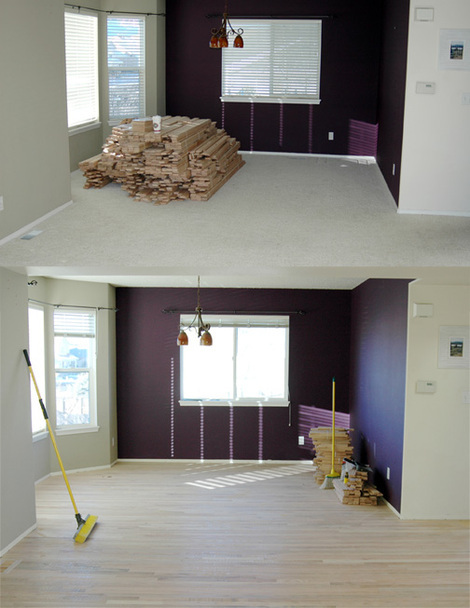 . . this remodel is turning us into the perfect family! A couple more weeks of this and we'll realize that we don't even NEED the main floor of our house! Come to think of it - that may not have been the best pitch to sell my husband on this expensive remodel. Yeah. Luckily I was saved from further foot-in-mouth utterances by my son, who was messing around with Emma's GameBoy right about then. Karl: Hey Mom, check this out! (shows me the screen) Look what it says on the bottom. Me: (laughing) QUITTER?! That's what it says when you want to quit? Because, indeed, it said on the menu "QUITTER" at the bottom instead of "QUIT". John: So the game admonishes you for quitting? Karl: Actually, I made it say that by changing the language. Kitchaga Continues . . . The fridge continues to look fabulous, even with drywall dust sticking to the fingerprints. So there's that. The panic attack wasn't really about the lack of kitchen. That hasn't really set in, since we have the microwave in the basement, a healthy supply of peanut butter and jelly, access to cold Diet Coke, and back-to-back invitations to Ev's house for dinner. *SHE* deserves a designer kitchen more than I do, what with her being a fabulous cook and all, whereas I'm more of a "Mac n' Cheese" and "Anything Made With Bisquick" type of gal, but my lack of culinary abilities was not the cause of the panic attack. It all started on Tuesday, when the floor guys dropped off the wood. I was showing them the kitchen, saying that it was all going to be torn out, when one of them said: "Wow! 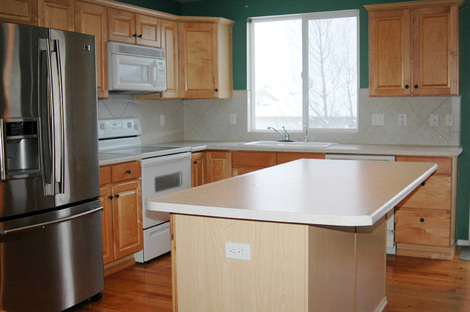 What are you doing with your old cabinets? These are NICE!" "Yes, they really aren't bad," I admitted, "But I want to reconfigure the kitchen and expand the island, so it will require new cabinetry. These aren't the right sizes." "Man! These are so nice! I'd love to have cabinets like these!" he replied, making me feel like a spoiled brat who should be thinking of people in impoverished parts of the world who don't have cabinetry at all. And actually, I kept almost all the old cabinets to make a kick-booty office space for John in the basement. He did express concern that already having cabinets in my office and then adding cabinets to his office space will render the basement "over-cabinetized", but is there really such a thing? I don't think so. So after the floor guys left I was slightly uneasy about the "waste" of perfectly good cabinets. "What are you doing with the appliances?" Leo asked. "Well we're replacing them with stainless steel, except for the fridge, which we already replaced, so the microwave will go in the basement until the job is done, and the others I guess we'll donate." "Wow! These are NICE appliances!" K-John piped in. "Well yes, they are," I admitted, "But we want stainless steel, a quieter dishwasher, and a gas cooktop, so they really have to be replaced." I said that last part with confidence. The same confidence that brought me this far on this journey. And so, sensing my confidence, they went to work with their sledgehammers and a few short hours later I had no kitchen. And meanwhile I was starting to feel uneasy, like a spoiled brat who didn't appreciate the fact that people don't have quiet dishwashers in impoverished parts of the world. They also don't have dishes. Or food. You know. It looks like "After" doesn't it? It's OK, you can say it. With everything off the counters (no phones, toasters, purses, drying dishes) it looks rather spacious and lovely, doesn't it? And from this angle you can't see where the laminate has torn off the side of the island counter or how the broken dishwasher bottom is hanging at an unseemly angle. In truth, it looks, well, nice. And THAT was the cause of the panic attack. I started totaling. You know - the floor contract, the cabinet contract, the construction contract, the countertops contract, the gas line contract, the small car that is the appliance bill . . . add them all together. And then I started hoping that the kids are smart enough to get college scholarships. Is the island too big? Should I have put the microwave on the other side? Why did I design this myself? 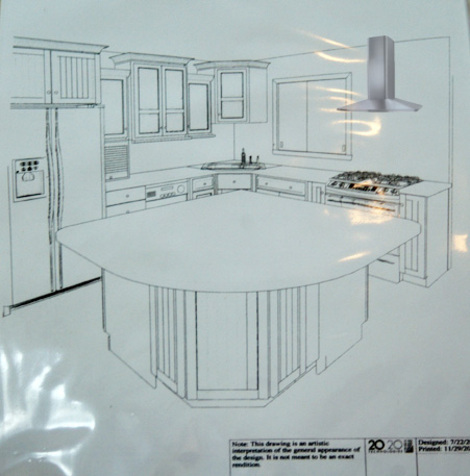 What if the kitchen designer who has, you know, training, was swayed by my design and didn't consider better options? Oh crap! I didn't consider the oven door opening to that island. Is there enough clearance? What if there isn't enough clearance? Should I rotate the island 90 degrees? Will it stick out too much into the family room? What do I need with a fancy kitchen anyway? What if John gets a transfer and we have to move? Will I recover any of this cost? What if his car needs replacing? What are braces for the kids going to cost? What if I don't book enough gigs for next year? Today the electricians are here, moving stuff around, installing a new circuit for the microwave and pendant lights, etc. And the guys just showed up to run the new gas line. This weekend we have to remove everything from this level of the house so the floor guys can work. So basically it's a war zone. is going to be better. And pretty. And functional. And worth every penny. Well . . . maybe not EVERY penny, but the majority of them. Like, 87% of the pennies.